Unless you come from a culture where eating with your hands is the norm, you’ll follow the adage, “When in Rome, do as the Romans do” easily after enlisting in Starfleet Academy, and that includes eating your meals with the Star Trek Starfleet Academy Titanium Spork. 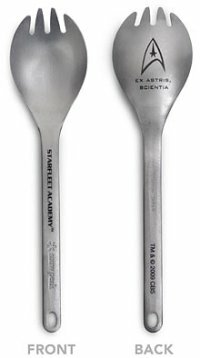 Seriously, folks, the Star Trek Starfleet Academy Titanium Spork is just about the coolest Star Trek collectible ever, because it is fully functional. Just like the one Kirk used while a student (perhaps even while planning to cheat at the Kobayashi Maru scenario), these are laser engraved with the Starfleet emblem and other stuff which we’ll tell you about soon. And remember, we know how important it is for you to hold a replica of Spock’s Student Spork at the premier of the new movie! Live long, and prosper. Bear in mind that these are not limited edition sporks, but feature a totally new design for the entire Federation (and us folks on earth) to enjoy. No need to look for an alien money changer as you can purchase it for good old American Dollars to the tune of $22.99.